Happy Winter Wednesday. 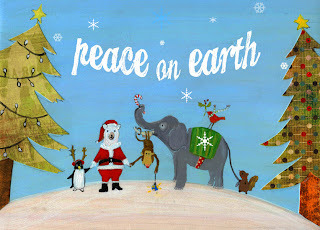 NEW 2013 Holiday Cards and 10% Off! Get a little package of these cards on Etsy! In this little scene, all the animals are holding hands, putting aside their differences for the holidays. The little monkey is holing a globe ornament in his hand. I am selling cards right now on Etsy, but I will also be releasing 8x10 prints very shortly, too. Today, Oct. 30, use the code SAVE10 for a 10% discount storewide! "House of Serenity" - Original acrylic & mixed media on wood panel 18x24 inches. I finished this new painting. 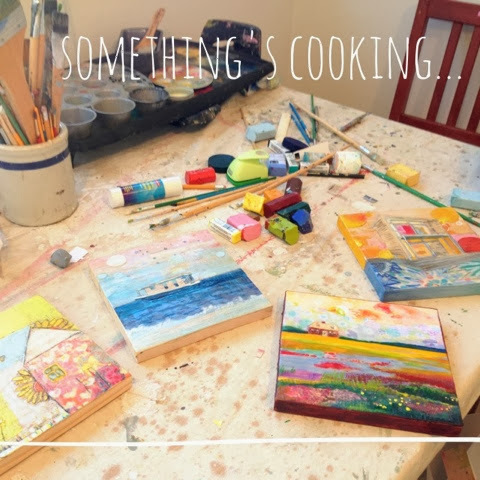 I was inspired by the beautiful, peaceful landscape of the Crab Meadow marsh by my home. I was jogging the other day when the unbelievable beauty of the early evening landscape prompted me to dash home & go back for a photo via bicycle. I managed to get there before the sun set. This fall weather is so spectacular. I find myself wishing I had a camera mounted on my bike's handlebars. This original painting is available through Lyrical Fine Art. Winter Wednesday Special Offer Today! 20% off the brand new Cathy Nichols 2014 Calendar today only! And stay tuned for a special offer every Wednesday from now until December 25th as part of my Winter Wednesdays promotion! To get the discount use coupon code CALENDAR14. "House of Winter Magic" Available as a print at my Etsy shop. 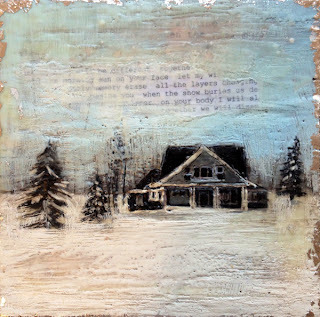 Inspiration for New Painting "House of Winter Magic"
This little strip of patterned paper was created by lyrics from musician Jay Dipaola. They are so beautiful and have inspired a new painting I am creating. 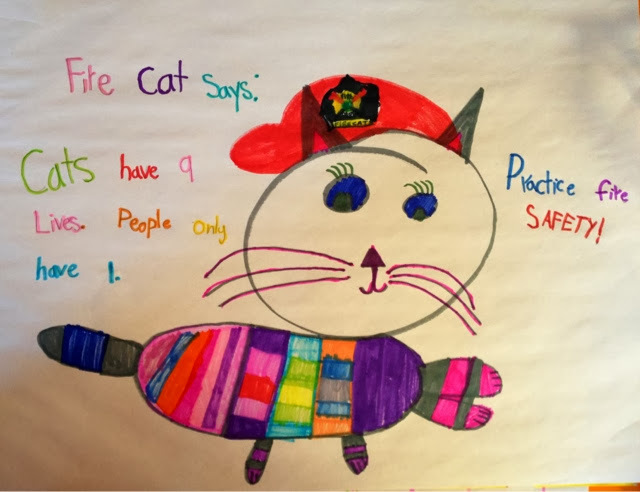 on your body I will sleep"
Annabelle's fire prevention poster. I love Fire Cat! What do you get when you mix music and painting? Lots of beautiful live music for inspiration and maybe even collaboration. Stay tuned for more news about this new project. 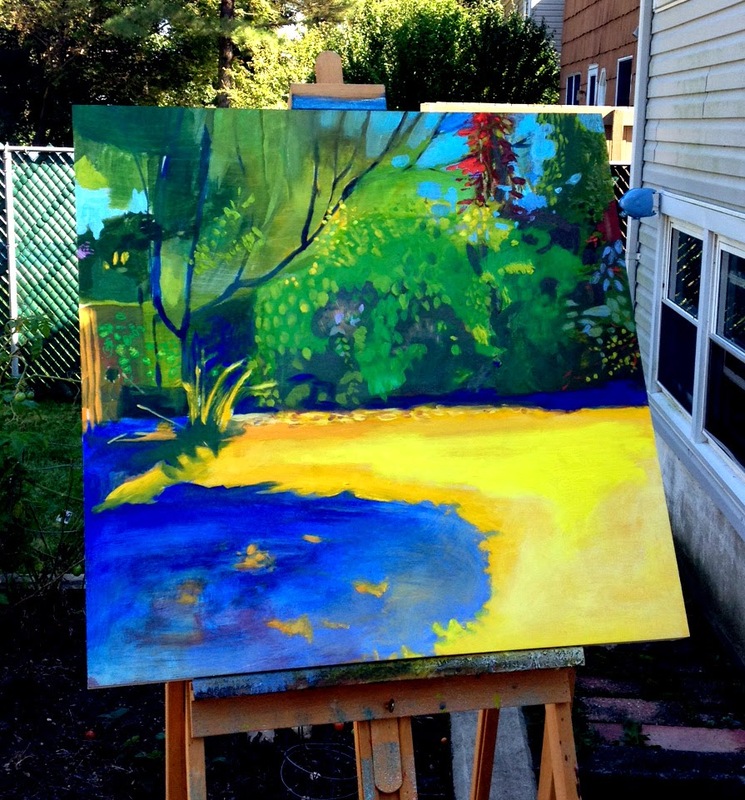 For the past two afternoons, while the kids are at school, I have been experimenting with painting my backyard "en plein air." What amazed me about this process was how interesting my old backyard was once I started concentrating on it! When I first looked at it, I was like, "Ok, I have this enormous 30x30 inch wood panel and nowhere else I can lug it to but the backyard, but it's a shame all I see is green, green green." Apparently, somewhere along the way, this perception expanded to include some other colors! I am not done with this piece yet, but I will keep you posted. So far, this is a really interesting experiment.